No topic more occupied the Victorian mind than health. Great advances in medical treatment were made during this era: surgery became more advanced and safer, because of the use of antiseptic to curb the spread of disease. 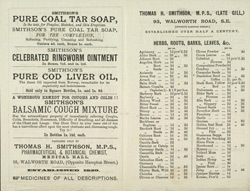 Despite this, many people in the Victorian age still depended upon traditional cures, and over-the-counter remedies. For those that distrusted or could not afford prescription medicines, chemists shops such as this one would stock both patented and 'secret' medicines, with special ingredients unknown to the consumer.